St. Paul, Minn., May 11, 2018 – PolyMet Mining Corp (“PolyMet” or the “company”) TSX: POM; NYSE MKT: PLM – today reported that it has filed its financial results for the three months ended March 31, 2018. PolyMet controls 100 percent of the development-stage NorthMet copper-nickel-precious metals ore-body and the nearby Erie Plant, located near Hoyt Lakes in the established mining district of the Mesabi Iron Range in northeastern Minnesota. In March 2018, the company issued an Updated Technical Report under NI 43-101 incorporating process improvements, project improvements, and environmental controls described in the Final Environmental Impact Statement and draft permits. The update also included detailed capital costs, operating costs, and economic valuation for the mine plan being permitted as well as potential future production opportunities. 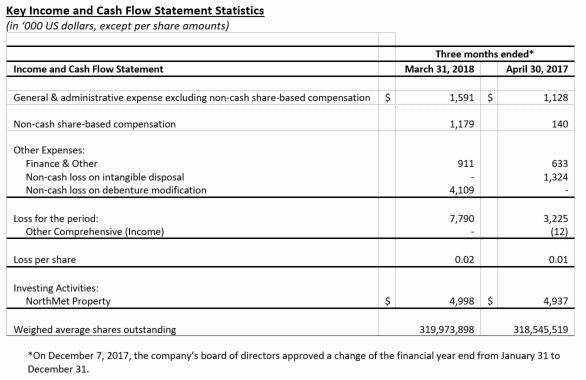 As at March 31, 2018, PolyMet had cash of $4.415 million compared with $6.931 million as at December 31, 2017. Subsequent to quarter end, an additional $20 million was received from Glencore as described above. As at March 31, 2018, PolyMet had spent $125.050 million on environmental review and permitting since the NorthMet Project moved from exploration to development stage. Loss for the three months ended March 31, 2018, was $7.790 million compared with $3.225 million for the prior year period primarily due to non-cash items. General and administrative expenses for the three months ended March 31, 2018, excluding non-cash share-based compensation, were $1.591 million compared with $1.128 million for the prior year period. Other expenses were $5.020 million compared with $1.957 million for the prior year period. PolyMet invested $4.998 million cash into its NorthMet Project during the three months ended March 31, 2018, compared with $4.937 million cash in the prior year period.